When I was young I had a hard time smiling for the camera. Mug shots of me were awkward and uncomfortable. But that quickly changed when our daughter Kate was born 29 years ago. It was as if a light bulb went on. For some magical reason that I will never understand, now that I was a father it was much easier to smile at will. This was one of the countless gifts that my kids gave to me. Fast forward to this year. Now that Kate and her brother Harry have started their careers, I’ve had the chutzpah to re-launch mine. After decades of a pretty rewarding job and a regular paycheck, I started an audio business, DaviesContent. My kids are both working for themselves, and now I am to. They’ve taught me about patience (something I don’t have much of), added to my rudimentary understanding of technology, and helped me understand that if you’re going to have a chance of being successful at being your own boss, you have to be remarkably persistent. That means seeing things through one project at a time, and one day at a time. 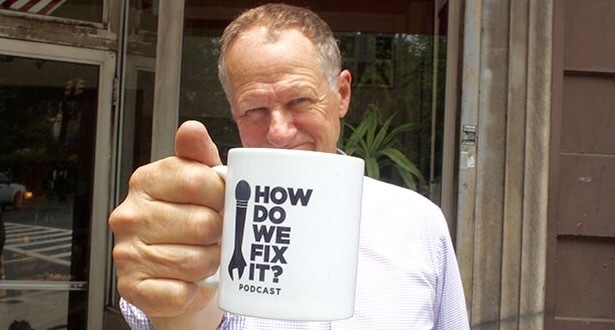 Publicizing and launching our new weekly podcast show this month, How Do We Fix It? and finding an audience for it is a struggle. The darned thing never goes away. I feel possessed! But watching and learning from my kids has added to my confidence and determination that this will be a big success. And I’m far from alone. Many other baby boomers are also launching grown-up startups. They have the audacity to put themselves out there, re-discovering the passion that they had when they were young: doing something new, and perhaps making a difference. Like me, many other fathers have watched their gutsy,determined adult children as they knock on doors and learn new tricks in a rapidly changing and uncertain job market. We really can learn from them. For me , Father’s Day is not just a celebration of Dads, it’s also a chance to reflect on what our children have brought to us. So so true, honest and from the heart.. Thank you.